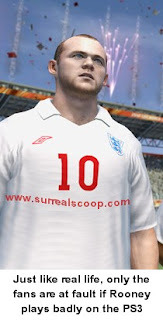 Computer game salesman Wayne Rooney was today left reeling from the revelation that his dreams of World Cup stardom may exist only on the Playstation after once again being comprehensively outplayed by players of English Championship standard in South Africa. Wayne Rooney was speaking after being booed off the field having failed in 3 hours of football to worry defenders from a country with no grass that has only recently stopped murdering each other over sand dunes and another that thinks you play football with your hands. The England camp today pleaded for calm and for fans to support struggling players, such as Rooney, or the amazing disappearing Lampard, and to really get behind the team ahead of Wednesday’s must win game against the mighty Slovenia. Reflecting on his performance Wayne Rooney promised that he had really taken on board the message that the fans had sent out by managing to boo louder than the vuvuzelas and it would lead to a definite change in his playing style.